I've been working with Dr. Easton since 2001 and I take care of patient scheduling, help with insurance questions, and assist the doctor with other office tasks. When you call, I'm probably the one to answer, and I am more than happy to help you with all your questions and make you feel welcome. I truly enjoy being able to get to know our patients and their families. I am married with two wonderful daughters, four dogs, and three cats. In my free time I enjoy playing tennis and traveling to Oklahoma to visit my daughter. I also love decorating my house and gardening. I'm Dr. Easton's office manager, so I coordinate treatments, schedule appointments, and help our patients with any questions they may have. I love seeing how orthodontics changes lives. Seeing the confidence people have with a beautiful smile is very rewarding. Dr. Easton takes wonderful care of his patients and takes great pride in his work. I am married to Dr. Easton and we have two married daughters, one son, and two grandchildren. We also have a big yellow cat named Mr. Biggers. I love playing golf, working in the garden, and being active in the community. 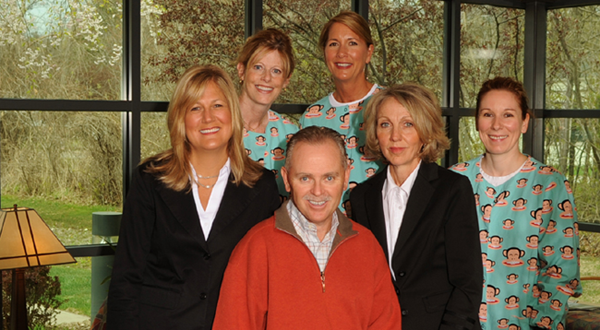 I have worked for Dr. Easton since 2008 as a dental hygienist and an orthodontic assistant. I enjoy helping our patients have great dental hygiene while they're in braces. I love to give them special tips and encouragement to make sure they have a beautiful, healthy smile when their braces are removed. I am married with two children and a Lab mix named Lily. In my free time I enjoy scrap booking, watching my children's sport and school activities, and am involved in the Ladies Auxiliary at Emmett VFW. I have been here since 1994 as an orthodontic assistant and love my job! I love to talk to our patients and find out how things are going in their lives. I enjoy the stories they tell and hearing about their sports teams and school activities. I have made some wonderful friendships, both with our patients and with the great team I work with. I am married with one married daughter and a granddaughter. I also have two dogs named Buster and Tyson. I am a Certified Spinning Instructor, and I love to garden, read, and travel. I started working for Dr. Easton in January of 2013. I started as a receptionist and have now transitioned to assisting the doctor as well. I am enjoying getting to know our patients and helping them with their braces. Depending on the day, you will either see me up front answering phones and filing, or in the back helping with patients with their appointments. I am married with two children. Both of my children are in high school at Cros-Lex and I am very involved in their activities including band, quiz bowl, tennis and power lifting. I also run my own business and teach zumba classes. In my spare time, I love spending time with my family, gardening, and cooking. College in Port Huron in 2012. I am always learning something new about dentistry. I enjoy seeing my co-workers and our patients everyday. I have a boyfriend named Kevin and I have two cats. My cats names are Tomcat and Missy. In my free time I enjoy hanging out with my friends and playing with my cats.